They are currently investigating an issue where players were unable to connect to the server. Correction of the bug where some of the EXP drops down for characters linked with PSO2es. Maintenance is scheduled to end around 13:00 JST, but it may end earlier or later depending on the situation. They plan to distribute some form of compensation for this issue. Details will be revealed at a later time. They also have plans to reschedule the emergency quests affected by this maintenance, which will be posted at a later time. These will be added to the calendar. Sizustar linked to the video showcasing PSO2 Taiwan‘s exclusive content. A new Dark Falz battle will be arriving in the May 7th update. 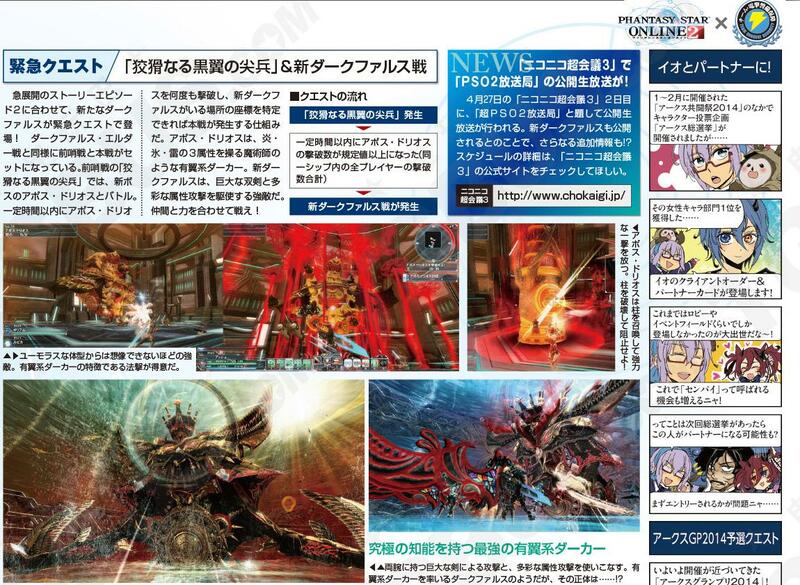 The new Dark Falz has two phases similar to the Falz Arms and Elder battles. The first quest, [The Cunning Ebon-Winged Vanguard] lets you face a new boss known as “アポス・ドリオス” Apos Dorios! Apos Dorios is a wing-type Darker magician who can manipulate three elements; fire, ice, and lightning. It can summon pillars on the field that will eventually lead to a powerful attack. You can intercept this attack by destroying the pillars. The new Dark Falz can drop Red Scorpio, Caduceus, Edel Arrow, Gal Wind, Lavis Blade, Meteor Cudgel, Berdysh, and Judgement Hearts.